Have you ever dreamed of driving off into the sunset, changing your name, and disappearing? 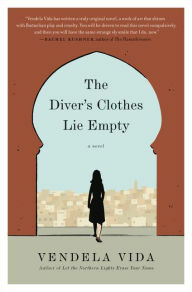 In Vendela Vida’s The Diver’s Clothes Lie Empty, a theft in Morocco triggers a series of identity swaps for an American tourist. Using the mysterious and exotic setting of Casablanca and focusing on all travelers’ paranoia of losing valuables (Rick Steves’ hidden security pouch sells well), Vida slyly manipulates the story line, drawing the reader into seemingly innocuous events. The thirty-something woman (we never do know her real name) morphs from a harried Florida traveler on an economy trip to staying at a posh hotel as Sabine Alyse, when the local police replace her stolen backpack with someone else’s. Her adventure continues when she is tapped to be a stand-in for a famous American movie star who is filming at the location. A final bus trip out-of-town reveals her true identity when fellow Floridians on holiday recognize her – the past is hard to escape. The reason for her trip remains unclear until the end, when her dark secrets are revealed. I didn’t see it coming, and I won’t spoil it for you, but the reasons for her erratic behavior are not jet lag. This entry was posted in authors, book review, books, mysteries, reading and tagged Book, Casablanca, Florida, Morocco, Patti Smith, The Diver's Clothes Lie Empty, Vendela Vida. Bookmark the permalink.